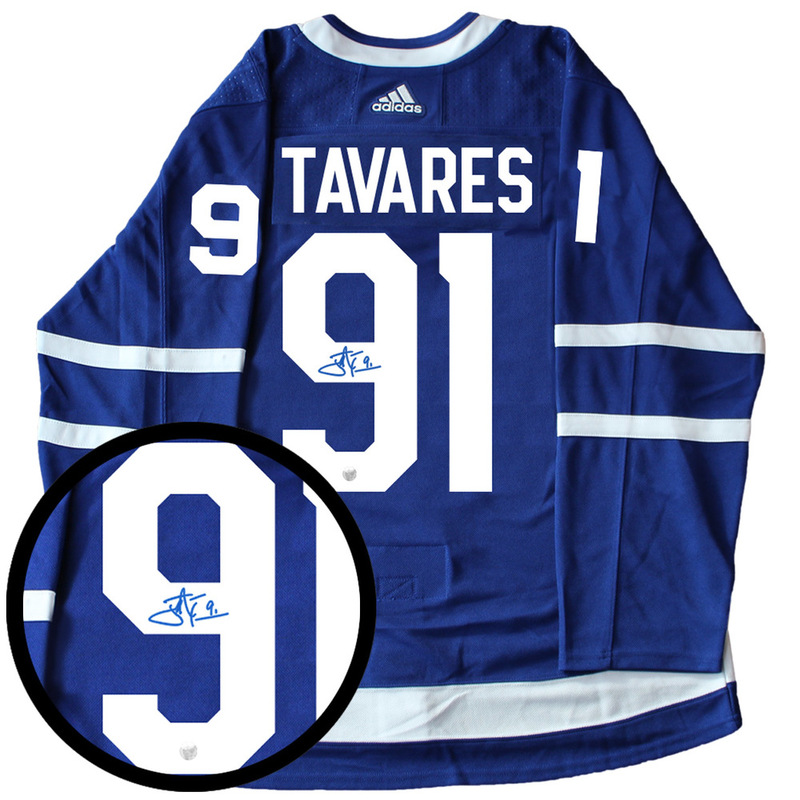 This Toronto Maple Leafs Authentic Adidas ADIZERO Professional Grade Home Blue jersey comes personally autographed by Frameworth exclusive athlete John Tavares. This jersey comes with a Frameworth hologram and certificate of authenticity to ensure the legitimacy of the signature. Frameworth is proud to offer the new ADIZERO Authentic NHL jerseys. The Adidas ADIZERO Authentic jerseys are lighter than past models and feature cresting materials and construction technology. The ADIZERO Authentic NHL jersey reduces crest weight by up to 46%, while a single layer perforated numbering system reduces number weight by up to 60%, in order to deliver a new jersey that is up to 19% lighter when compared to the current NHL Jersey.Cooler - The ADIZERO Authentic NHL jersey features Adidas Clima® technology in each of the jersey fabrics to deliver breathability and enhanced performance. Combining moisture management technology and a streamlined silhouette to maximize air flow circulation with materials that are up to 133% more permeable than fabrics currently used on ice allows athletes to be cooler. Stronger - Constructed for durability, the ADIZERO Authentic NHL jersey fabrics are up to 27% stronger in burst testing and up to 72% tougher in abrasion testing compared to the current NHL jersey. We do not not guarantee jersey sizes but typically carry sizes 52, 54, & 56.